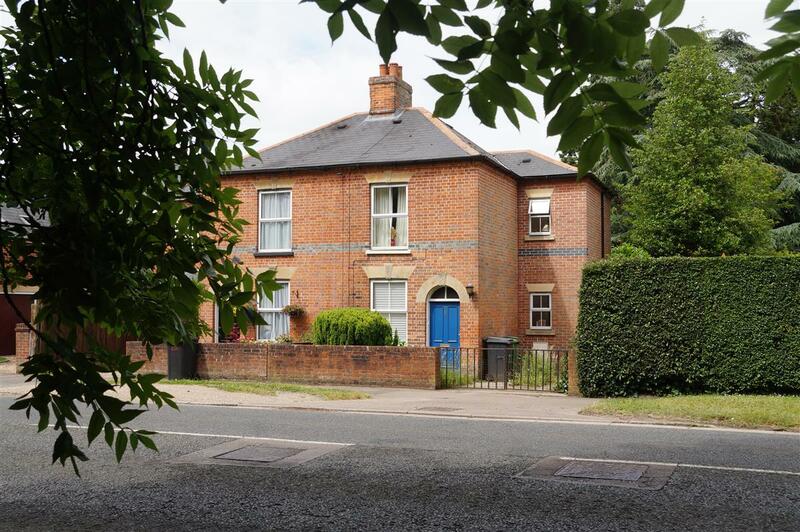 252 Andover Road (nearest camera) and 254 - formerly Wenman's Cottages, the Partridge family home in Newbury. Joseph was born in London in 1883, reportedly the son of Joseph Partridge. Two years later, in 1885, Joseph senior married Anne Staniford. It is not clear whether Anne was Joseph’s mother. Joseph senior joined the Royal Marine Artillery, which resulted in the family moving to Portsmouth, where the RMA Barracks were situated in Eastney - the south eastern section of Portsea Island. They lived in Highland Road. Joseph and Anne had four children while living there: Anne (born c1887), Eliza (c1889) , Louisa (c1892) and Frank (c1894). Approximate dates are given, calculated from later census entries, but no birth registrations have been found. Between Frank’s birth in 1894 and 1896 the family moved to Enborne, a parish that adjoins Newbury to the west. The move was almost certainly the result of Joseph’s term of enlistment with the Royal Marines coming to an end. Enborne was, no doubt, chosen for the availability of work and housing and as a place familiar to Joseph, who was born and raised in Newtown, another parish adjacent Newbury but over the Hampshire/Berkshire border to the south. Here another son, William, was born in 1896. The next move was to Wash Common in Newbury, which was a semi-rural part of Newbury alongside Enborne, their move could have been a very short one. They lived on Wash Common at Wenman’s Cottages. Two more children, John (1898) and Emily (1902) were born here. Wenman’s Cottages (so named because they were owned by Mrs Wenman) are still standing, though the large neighbouring houses (Glendale Lodge and Battledene) have been replaced by housing developments. The Partridge’s old home is now 252 Andover Road. Following his schooling, which would have ended when he was fourteen, Joseph found employment on local farms, by 1901 he was cattleman at Elm Farm in East Woodhay. In 1909 Joseph married Alice Louisa Burr and set up home with his bride at 6 Westfield Gate, Newbury having found employment as a domestic gardener. A year later their first children were born, twins John William and Joseph James. Sadly they both died soon after birth. In 1911, less than a month before she was recorded in the family’s census return a healthy daughter, Beatrice May Louisa, was born. Their son, Stanley F, was born in 1915. When war arrived in 1914 Joseph was a married man with family responsibilities, he did not answer Kitchener’s call, however, when conscription appeared inevitable he did volunteer. 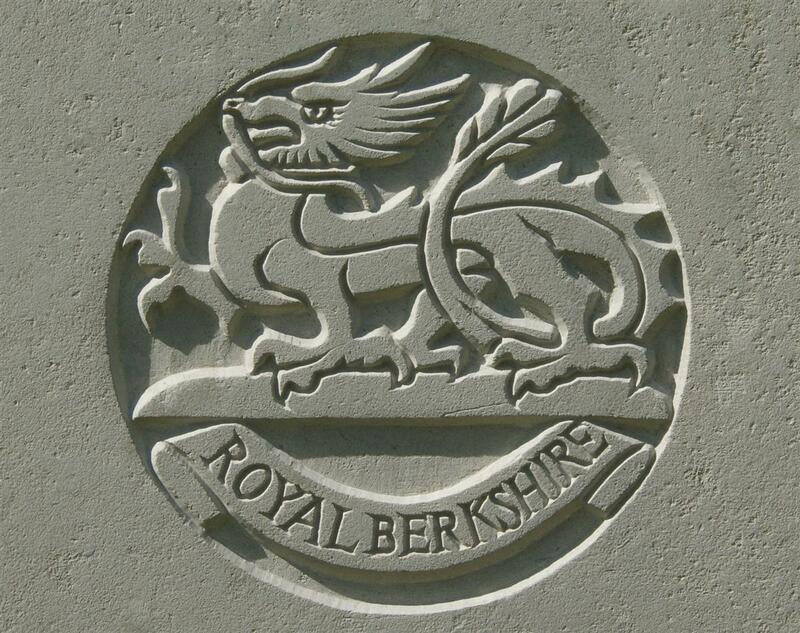 He enlisted on 10 December 1915 into the Territorial element of the Royal Berkshire Regiment. His service was with the 2nd/4th Battalion of the Regiment – had he enlisted a few months earlier this might be taken as an indication that he was attempting to avoid overseas service by signing up with a Home Service unit. The so called 2nd Line Territorial units comprised men who had volunteered to defend their country, but had refused to sign the Imperial Service Obligation – a means of volunteering to forego the ‘Home Service only’ nature of the Territorials’ enlistment and hence to serve overseas. In reality, long before Joseph’s basic training would have been completed the terms of the Territorials’ enlistment were modified by the Military Service Act of January 1916 – rendering them all liable to overseas service as required. Nevertheless it may well have been the idea of enlisting into a home service battalion before the arrival of conscription that led to Joseph’s choice. One thing that he would have had on his mind was the death of his younger brother Frank in France on 13 October 1915, fewer than three months before he signed up. At enlistment he gave his occupation as cowman, his farming skills would have been in great demand following the rush to enlist in 1914. Many young farm workers left the land causing a crisis on farms – he would have been far more useful working as a cowman than as a domestic gardener. Although it is known when he enlisted it is not possible to determine when he crossed the channel to join the 2/4th Battalion in the field. The battalion as a whole crossed to France on 27 May 1916. It is unlikely, but not impossible, that Joseph would have been with them. A new recruit would normally spend at least six months in training before being sent overseas. Obviously, once the battalion settled into its duties in the line, it would lose men to enemy action, accident, sickness and disease so a steady stream of men would be sent over as replacements. In July 1916 the battalion suffered heavy casualties during the Battle of Fromelles, an unnecessary battle that turned out to be an unmitigated disaster. Through 1917 it was involved in a number of actions, including the Battle of Langemarck, an element of the larger 3rd Battle of Ypres (commonly referred to as Passchendaele). In the spring of 1918 the Germans launched a series of offensives against the British lines, first on the Somme front then further north around the River Lys. The 2/4th Royal Berks were with the 61st (2nd South Midland) Division, one of the divisions that was in the line near St Quentin on 21 March when the Germans struck on the Somme. Fighting a fierce rearguard action the Division suffered heavy casualties, so much so that they were sent to a quiet sector to regroup and absorb reinforcements. The pressure of the German offensive on the Somme was such that the battered divisions could not be taken out of the line completely, hence their presence on the La Bassee Canal near Bethune when the second German offensive struck them on 9 April. The 2/4th Royal Berks were fortunate in being behind the lines resting when the assault struck the division a few miles to the east. On 11 April the battalion took up positions in front of Robecq, where a determined defence was able to slow and eventually halt the German advance. Despite further heavy casualties the Division could still not be spared from the line; it was still manning trenches at Robecq at the end of the month. Joseph’s battalion was less damaged than many of the other battalions in the 61st Division and spent most of the rest of April in the forward area, suffering regular casualties from enemy shelling. War Diary, 2/4th Battalion, Royal Berkshire Regiment – 29 April 1918. LALEAU. The day was dull with a few showers. The Battalion Area was shelled from 12 Noon to 2pm and 8.30pm to 9.30pm. As a result of this Battalion Headquarters was moved to PONT L’EPINETTE and “A” and “B” Coys, into Billets near by. The area was again heavily shelled from 11 to 11.30pm. Total casualties being Killed 4 ORs. Wounded 10 ORs. Laleau and Pont l’Epinette are hamlets sited around two bridges over the La Basee Canal immediately to the west of the village of Robecq. Joseph’s death is record as having occurred on 29 April, probably one of the four ‘other ranks’ recorded in the battalion war diary as being killed that day. However, this is not quite certain as the Commonwealth War Graves Commission records five deaths of members of the battalion that day. Two of these were buried in St Venan-Robecq, very close to the battalion’s positions, another is recorded on the Loos Memorial (a common fate for a victim of a direct hit from an enemy shell). Joseph’s body lies in grave B.6 at Berguette Churchyard, some distance from the battalion’s positions but very close to the location of one of the 61st Division’s advanced dressing stations (2/1st South Midland Field Ambulance). It is very likely that he was wounded and evacuated this far before succumbing to his wounds. 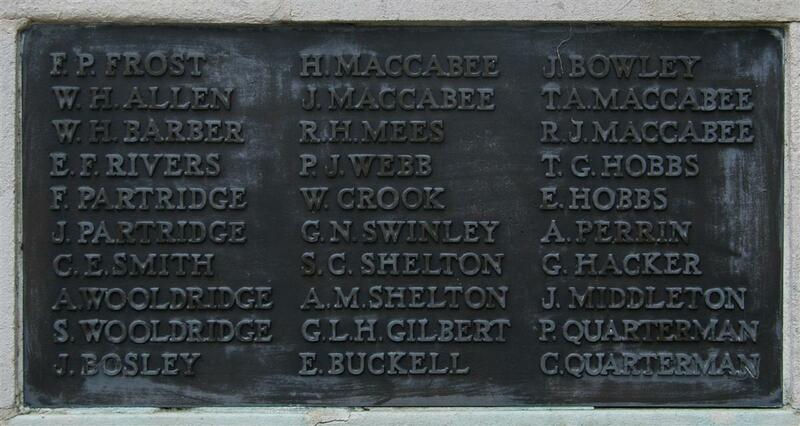 Joseph's name on Newbury War Memorial. The fifth 2/4th Berks fatality of that day is buried at Cuinchy, considerably further from the battalion and, therefore, more likely to have died as a result of wounds inflicted on an earlier date. Locally Joseph is remembered on tablet 2 of the Newbury Town War Memorial; immediately above his name is that of his brother Frank – his story is told here.